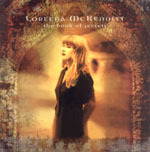 CD review: "The Book of Secrets"
What to make of Loreena McKennitt? A voice as rich and luxuriant as that of Maddy Pryor or June Tabor. An ear for writing new songs that sound as old and traditional as the reels the Clancy Brothers play. And a knack for marketing that gets her Celtic songs played on alternative rock stations. Balance those strengths against a Stevie Nicks-like tendency to go overboard on the dramatic side, to get a little new-agey at times. Still and all, the final result is quite good  although in the lineage of British folksters like Steeleye Span or The Strawbs rather than traditional Celtic music. McKennitt brings rock and classical into her music, much as the above groups did, and uses the recording studio to add layer upon layer of sound. It's probably a little too pop-oriented at times for more traditional-minded fans, but fine music nonetheless.